Accurate and reliable one-pocket automatic banknote counter. Outstanding, modern BellCon design with ergonomic operation. Available with different levels of banknote counterfeit detection. Several currencies available (please contact). Operational sound level below average. Batch counting number selectable from 1 to 200. Rejects suspect banknotes. 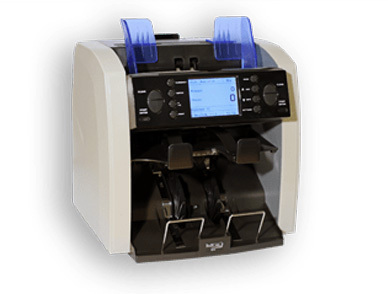 The machine stops automatically and the suspect note will not be counted. Also handles other currencies, coupons, vouchers etc. Large and clear LED display and easy-to-use keyboard. Data interface (RS232) for easy software upgrade and external display (optional).